If it is a network you can draw it. In many of my workshops about networks I ask the participants to draw a network they are part of. These drawings may be beautiful or basic, they all reveal crucial information about the social fabric networks are made of. The images often provide us with a valuable starting point for talking about and understanding networks, about how information is flowing and how knowledge is exchanged and co-created. Structure and role reflect the form, set- up and functioning of the network. The structure shows how the connections are intertwined, which patterns they form, how strong and resilient these connections are. Some networks are structured and steered. Others function more organically. Roles and responsibilities within a network are either assigned or fulfilled spontaneously. For example the role of the social weaver connecting members is a critical, often underestimated, function that helps make a network dynamic. “Becoming a network is often about learning to think in a new way, to expand beyond one’s comfort zone so as to connect with people at all levels – the transactional, knowledge-based, and even the emotional.” (p. 106). 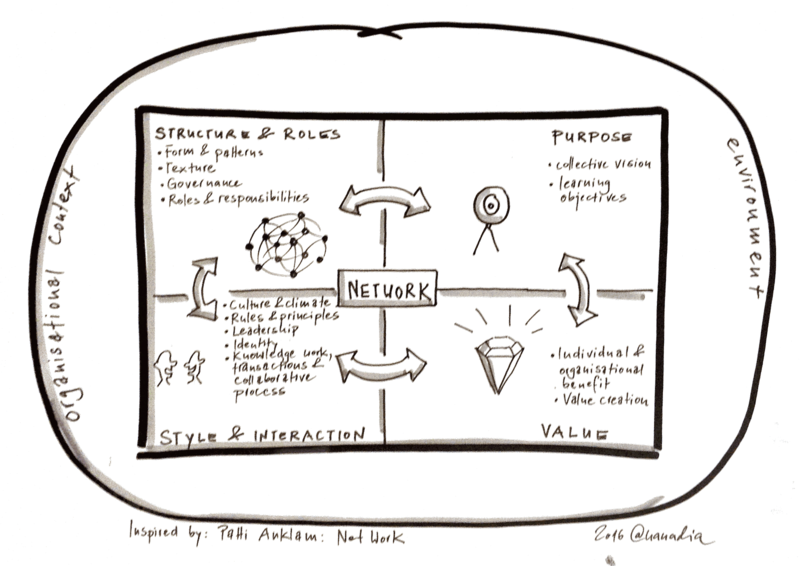 With purpose, structure & roles, style & interaction, and value we have the key puzzle pieces to describe networks. Putting these pieces together allows us to see the whole ‘network picture’ necessary to understand, steer and support successful networks. When talking about networks we tend to describe mainly structure and activities. It might be worthwhile to shift the focus also to style, purpose and value. Thank you, Nadia. I love the graphic!